All travelers are different and each have different wants and levels of comfort required and that’s perfectly ok. Some are happy with and need nothing more than the basics; a bed, shower and kitchenette. Others want more and are willing to pay for it to receive extra comforts, service and amenities. Which ever level is for you, there are a few things you may want to ask and know before you book your accommodation. You’ll need to book your stay at least 6-9 months in advance to secure and guarantee the best accommodation you find, for the price you want to pay. It is getting busier and Rarotonga is welcoming more visitors each year. 10 years ago I was booking 3 months in advance, in 2018/19 it seems 6-9 months in advance is now an advisable time frame. The first decision you’ll need to make. 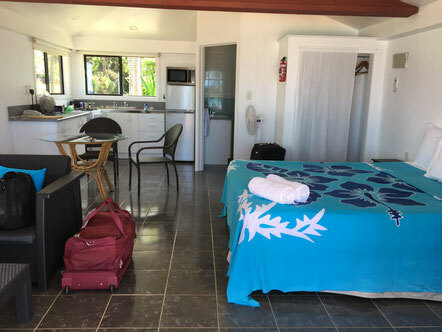 Rarotonga provides accommodation ranging from $27 a night up to $600 + a night. If looking for the cheaper range of prices, we offer a list of the best budget stays on the Island so you can narrow down your search and find your price. Our accommodation list will be added to over time. As you’ll be spending time mostly outdoors while on holiday here, weight up what you’ll want in your room or unit to make sure your accommodation will provide your level of needs. If holidaying on a budget, you might want to cook your own meals and need more than a kitchenette for example. Or would you prefer to forfeit amenities for being able to eat out often. 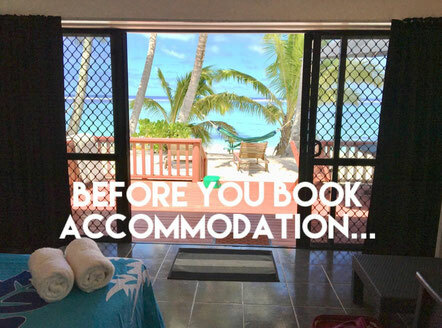 Rarotonga is not ‘equator hot’ but it is tropical and night temps range from 19℃ to 26℃ (66℉ to 79℉) Can you sleep while the temp is warm or will you need air conditioning? Blankets aren't needed at all but most properties provide one. Sleeping with a top sheet is adequate with night temps so warm. Some accommodation will provide extras like kayaks if on the beach, or a laundry to wash clothes and towels. TV’s, DVD’s and parking on site. What ever you’re looking for or willing to go without, find your accommodation with the amenities you want to give you the holiday you need. On the Google Earth app, zoom in on Rarotonga (we have a google earth map to use on this page) Search each property name to find exact location and have a good ol’ look around. See exactly where each is situated on the island. If you want beach front accommodation, you will be able to see the beach, what the area looks like and where you are close to for food and fun. If you’re ok with garden setting properties, you can see how far from the beach you will be staying and see the distance from the airport. See if your room will be close to the road, beachfront or further inland. This is my favourite way to make a decision as you can see from a birds eye view before you decide where to book. The rest of the world is not a priority while staying in Rarotonga. Come to the Islands to switch off and disengage from the rest of the world, but if you absolutely need some WiFi to post photos to family and friends back home, find out if the accommodation you like has or is near a ‘WiFi hot spot’. There are over 170 hot spots now but it might be good to check before you book so you’re not wandering around wasting holiday time trying to find a signal. Does the accommodation you’re interested in provide airport transfers? This is important as most flights are late at night so you’ll need to have this organised. If you’re lucky enough to arrive during the day, simple walk out to where the local circle Island bus stops and catch this to your accommodation at a fraction of the price of bus transfers or a taxi. The first bus for the day stops at the airport at 7:45am heading clockwise (45 mins past each hour) or from 8:35am heading anti clockwise (35 mins past each hour) and the last bus to the airport is at 10:45pm heading clockwise and 3:35pm heading anti clockwise. Take your arrival and departure time into consideration to plan ahead if public transport will be used as an airport transfer. Check our partner Wotif and other hotel booking sites for genuine customer reviews. Sometimes travelers will mention which room or bungalow has the best lagoon view or the quietest location. You’ll get a good insight into each property to narrow down your search. Locations are mentioned in reviews also and you may find a preferred place close to a supermarket, petrol station or an ATM. The best info comes from people who have experienced it for themselves and when there’s a lot of reviews, you’ll have a range of views to help you make your decision. When traveling to The Cook Islands from the West (Australia & New Zealand) you will be crossing the International Date Line and will essentially be going back in time taking you back to the day before. This is important to know when booking your accommodation to get your check in date correct. You don’t want to arrive late at night and your check in date is the next day leaving you nowhere to stay on your first night. I once had to tell a travel agent this when I was booking a trip to make sure I had the correct check in date as we were flying over the Date line. She said she was glad to know this so she wouldn’t book the wrong check in dates in the future. The same happens but in reverse when flying home. Because you fly across the Date Line, you'll arrive 1 or 2 days ahead of when you departed Rarotonga, if flying West to New Zealand or Australia and depending if you leave on a morning or night flight. Considering all of the above points before you decide to book your accommodation will give you the best options and you’ll enjoy the best choice property you can find for your needs and dollar. Leave a comment below if you have any more tips for booking the best budget accommodation you can find.